One month of Berlin marathon training is complete! Three months and two weeks left until race day. This upcoming week is my last week of easy buildup before getting into the meet of my plan and I’m excited / nervous at the same time. I know I can do the hard workouts that are coming my way but I also remember just how hard it was last summer. That said, I’m looking forward to getting fit and putting in the work for Berlin. This is my usual Sunday training recap. Please join in and link up! Monday: Much needed rest after returning from CA. I was wiped out and started an unfortunate trend of poor sleep that lasted all week. Tuesday: 5.61 easy miles but it was ridiculously humid. So so gross outside – this run was hard because the weather was terrible. Summer is here and is showing no mercy. Jen and I ran down to the splash park at Navy Yard to attempt to cool ourselves off. Wednesday: No running…BUT I got to see a cool running related video. Oiselle recently fielded a team to run an unsanctioned 340 mile relay race from LA to Vegas. The team was the first all-female team to register and ended up as the 7th team overall and the 1st female team. Super cool and inspiring and the team hosted a video showing plus talk with some of the participants. It was incredibly inspiring, plus fun to get to hang with Lauren Fleshman again (you might recall that I first met her at bird camp in 2015) and to get to see so many of my Oiselle family. Friday: 3.25 run commute from home. Sunday: 4 hot miles to finish the week. Do you have ridiculously high humidity like we do here in DC? If so, I’m sorry! And Happy Father’s Day to all you dads out there! We had some ridiculous humidity this week and yesterday was the worst. Ugh. This morning started out humid, but the humidity has dropped and it’s really quite pleasant! That’s more like it! The humidity here is awful – plus its like 75-80 degrees at 6am. Just UGH! Yes, the humidity here in GA has been bananas! I think yesterday morning (at 6:30AM!) was the worst of this summer! As we were sucking wind uphill, we kept reminding ourselves that Peachtree Road Race (July 4th 10K) will feel like this! YES! Saturday was the WORST. Just a nasty, swampy mess! UGH! That is so cool that you met Lauren! Yeah, we’ve had some humid weather in the city. Hopefully it won’t be too bad when you’re in town. Chicago’s humidity doesn’t hold a cancel to DC’s, lol 🙂 I’m looking forward to it although it’s going to be a tough week because I have MAJOR work events I’m executing almost every night. Wow, a month already?! I feel like the heat and humidity has come on way sooner than normal this year. We basically had no time to get acclimated to summer running – it went from pretty pleasant to unbearable in like one day! Exactly. The acclimation has NOT happened and therefore, it’s gonna be a rough few weeks! Oh yeah, the humidity is cray-cray here in CT. It was 97% humidity for my long run yesterday and today it was worse at 100%. 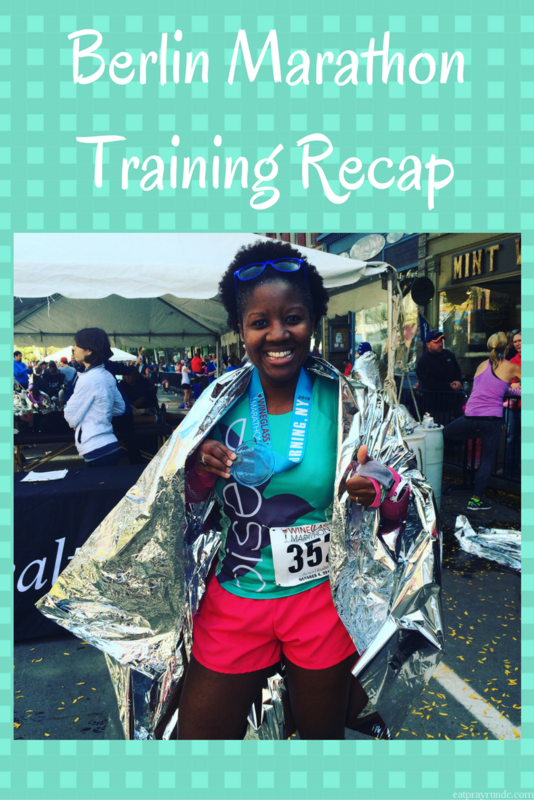 It literally felt like I was running through soup yesterday – so icky! Looks like you had a great week of runs! That Oiselle video sounds really interesting! The movie is awesome – it’ll be available digitally soon – it’s only about 15 minutes. You should totally watch it! What? One month down already? I guess time flies when you’re having fun! The workouts are hard, but you’ve crushed them again and again, so this summer will be no different! Wow one month! It seems like your training is going by so fast! It was humid here too, but I think I prefer that over hot sun. I, too, am eager to get out of the base building phase of training and start doing some harder work and getting fit. The hard work is coming quickly!! Congrats on finishing your first month of training for Berlin! It seems like everyone was hit with tough training conditions this week. Kudos to you for sticking it out to get it done and promoting safety with your CPR certification. Happy training! Thanks! It does seem like this was a tough weekend, weather wise! That humidity on Saturday morning was just brutal. I was so soaked in sweat by the end of my run that I was able to wring water out of my tank top! Yes. It was bad Sunday as well but not QUITE as bad as Saturday. I can’t believe you’re already one month into training but believe it or not, October really isn’t THAT far away. 2017 is flying by. It looks like you got some good runs in this week, even if you had some days off and it was humid. I feel like at least training in the heat and humidity will help for Fall races… it can be hot and humid in October, but no way is it as bad as it is in June and July. I know – we were lucky to have her with us for a bit before she came to camp. She’s so great – are you going to blog about camp? That sounds like a really cool film from Oiselle! And yeah, the humidity’s been crazy. The storms yesterday seem to have helped since my run this morning was pretty nice but who knows how long it will last. No humidity, but’s 120 degrées today, lol!! It’s dry heat though, as most say, jaja!! The hot humid weather is definitely my nemesis – we had some really rough days in Philly. Looks like marathon training is going strong! I can’t believe you are already one month into training! So exciting! It’s been super humid here (no surprise). If I don’t run in the morning, then it’s treadmill in the evenings. I can’t do it. I’m a total wimp! haha! After a fabulously cool and non-humid Tuesday morning run, the humidity is back! I hope you got to take advantage of the gorgeous weather!